220 pages | 169 Color Illus. 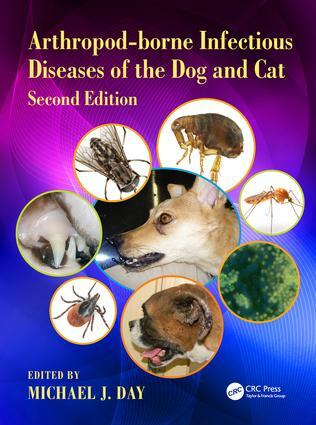 While its fundamental structure remains unchanged, this new edition adds a chapter on haemoplasma infections as well as a revised chapter on rare, and particularly viral, arthropod-borne diseases of dogs and cats. This new edition is fully updated to reflect the changes and geographical spread of the diseases covered. New for this edition is the inclusion of a series of clinical case studies providing relevant examples of the diseases discussed. In short, the book provides an accessible guide to arthropod-borne infectious disease for veterinarians both in practice and training. With the effects of climate change and increasing international pet travel, this book is a useful addition to every small animal practitioner's library. The book has contributions from leading researchers and is right up to date… It is well-written, easy-to-read and gives useful background. This book will be useful for veterinary students and early career researchers as well as small animal practitioners. "The authors have gathered top-notch specialists to cover some of the topics… not only should you get this book, you must read it carefully." "This beautifully illustrated and comprehensive book should be in every practice library."